Study finds increasing yellow times at photo enforced intersections in Chicago, Illinois produced the greatest reduction in red light compliance. 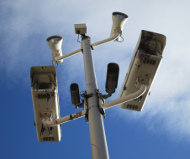 A total of 10,944 observations were recorded by the Windy City’s cameras, operated by Redflex Traffic Systems of Australia. Statistical analysis confirmed that increasing the yellow time from 3 seconds to 4 seconds had more of a positive impact than any other variable in the study when it came to reducing red light running. Other factors proved to have far less impact, such as having a higher speed limit or a wider intersection. “Longer yellow phase duration increases the probability of drivers passing through an intersection before the signal turns red, avoiding a violation,” the study noted. The study then examined the impact of adjusting each variable on related behaviours, such as turning right on red, or running the red light by a mere fraction of a second. These are the infractions that make up the bulk of the Chicago program’s annual revenue. In every test, the longer yellows came out on top in terms of effectiveness. The findings on the longer yellow timing are consistent with past independent research .